Announcement Free Shipping to the US! Punchneedle Embroidery Hoop Art, Punch Needle 3D Framed Art, Wearable Fiber Art, and Christmas Ornaments. 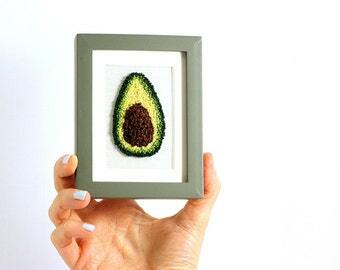 Home of the original Punch Needle Embroidered Avocado! But please feel free to convo me! My punchneedle creations have been featured on The Martha Stewart Show, marthastewart.com, Apartment Therapy, Apartment Therapy's Re-Nest, www.mrxstitch.com, Plus Model Magazine, RogerandChris.com, Going Home to Roost, SheKnows.com, Paper and Stitch Blog, Stitches Magazine (Gold Needle Award in 2012!) Ponderandstitch's blog, Etsy's Front Page (back-in-the-day), Etsy's Blog, Etsy's account on Facebook/Twitter/Instagram and the Etsy Finds. Free Shipping to the US! Punchneedle Embroidery Hoop Art, Punch Needle 3D Framed Art, Wearable Fiber Art, and Christmas Ornaments. Home of the original Punch Needle Embroidered Avocado! Anatomical Uterus sculpture a 3 inch hoop. Feminist Christmas Ornament. Punchneedle Embroidery. Feminist Stocking Stuffer. Anatomical Uterus sculpture Mini Frame. Feminist Fiber Art. Home or Office Decor. Punchneedle Embroidery. Feminist Stocking Stuffer. Custom Beard or Beard and Hair Silhouette Embroidery Hoop Art. Custom Couple Portrait. Cotton Anniversary gift for Him Her. Avocado Pin. Punchneedle Embroidery. Green, Purple, Brown. Large. Quirky Fun Fashion for Her. 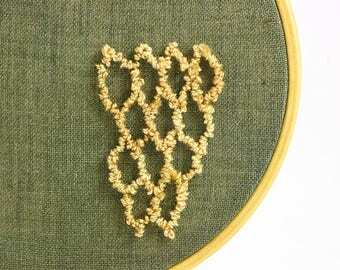 Honeycomb Hexagon Embroidery Hoop Art. Punchneedle. Home Decor. Eco Friendly. Geometric, Green, Yellow. 4 Inch Hoop. 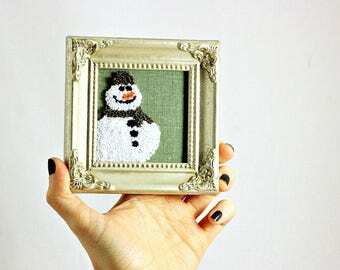 Snowman Punchneedle in a Mini Frame. 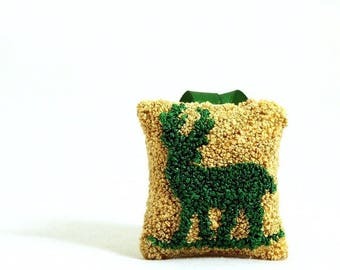 Stocking Stuffer, Christmas Decor, Punchneedle Embroidery Green and White. Ready to Ship! 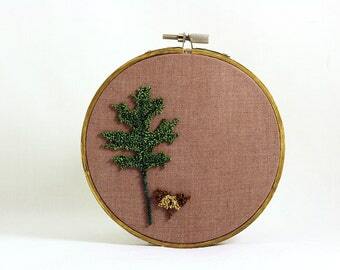 Pin Oak Leaf and Acorn Punchneedle Embroidery Hoop Wall Art. Botanical Fiber Art. Spring Green and Brown. Nature. Ready to Ship. Honey Bee in a Mini Weathered Hexagon Frame. Punchneedle Embroidery Fiber Art. Bee Keeper Gift. Home Decor. Light Green, Black, Yellow. Avocado Love Necklace. Silver Rectangular Pendant. Punchneedle Embroidery. Green, Brown. Embroidered Wearable Fiber Art. 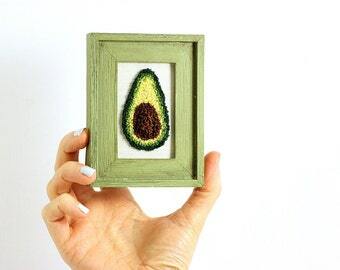 Avocado Matted in a Mini Grey Frame. Punchneedle Embroidery Fiber Art. Home Decor. Green, Brown, Yellow. Avocado art. Tree of Love in a Mini Frame. Punchneedle Embroidery Fiber Art. Home Decor. Green, Brown, Red. Hearts, Love. Woodland. Ready to ship! 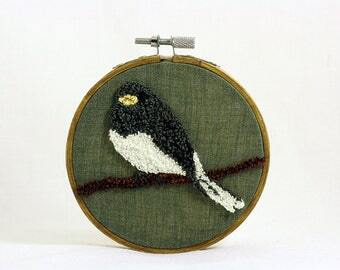 Quaking Aspen and Seed Punchneedle Embroidery Hoop Wall Art. Botanical Fiber Art. Spring Green and Brown. Nature. Ready to Ship. This thing is really cool and is a very unique way to take a snapshot of us at a certain point in our lives. It was a great anniversary gift! Production and shipping were both very reasonable and I received this right when I should have. Anika and her bearded beauty husband recently celebrated their second anniversary. Anika chose our custom couple silhouette portrait as the traditional 'cotton' gift - as the fabric and embroidery floss used on these pieces are made from cotton! Shop Update is live, a new series of backyard birds is now available! 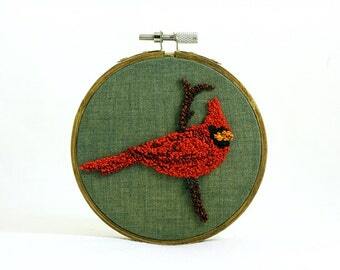 In a gallery wall series or individually, this embroidery hoop art is sure to brighten any home or office and bring a smile to the face of any backyard birder. Order by 12/20 in the US! 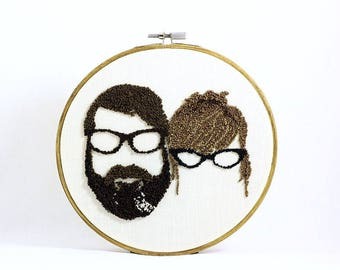 Lori chose our Punchneedle Custom Couple Silhouettes as a Cotton Anniversary gift for her ginger-beauty husband. We love appreciation photos so very much! The Harp is me, and the Thistle is he. My name is Erin. I'm an actor and singer in the NYC area. Auditions, Rehearsals, and TV shoots are sometimes filled with a lot of wait time, so I would always bring my punch needle projects to work on. Fellow cast mates would tell me I should sell them, so in 2010 I took their advice and opened up shop here on Etsy. My husband Corey frames, photographs all the merchandise, and ships the items. We're both theatre nerds, we met on a touring show 20 years ago. I was in the cast, he was the show's Technical Director. My punchneedle creations have been featured on The Martha Stewart Show, marthastewart.com, Apartment Therapy, Apartment Therapy's Re-Nest, www.mrxstitch.com, Plus Model Magazine, RogerandChris.com, Going Home to Roost, SheKnows.com, Paper and Stitch Blog, Stitches Magazine (Gold Needle Award in 2012!) Ponderandstitch's blog, Etsy's Front Page (back-in-the-good-old-days), Etsy's Blog, Etsy's account on Facebook/Twitter/Instagram and the Etsy Finds. Corey and I are having a blast working together - we have several silly rituals. For example - slow in the shop? We send "vibes" through the computer together and say: "sales.... zap!" We have been known to do a Sales Dance or two before a big festival or Cyber Monday. Getting the booth and merchandise ready for shows or the holiday season usually means a Buffy the Vampire Slayer or Downton Abbey marathon on Netflix at our house. Yep, we know. We're dorks. Hi there and welcome to my shop! I specialize in Punch needle embroidery. A lot of people tell me "Hey! I'm crafty and I've never seen that form of embroidery before! What the heck is that?!" So - if you're one of those folks, read on! Punch Needle or Needle Punch, is an ancient rug-hooking technique shrunken down onto a much smaller scale and uses a special twice-threaded hollow needle, embroidery floss and weaver's cloth. Each tiny loop is painstakingly and meticulously hand punched with love by me. What makes this technique so unique is that the needle itself is adjustable, so some loops can be made longer for depth. It's what makes punchneedle so special, and different from all other forms of embroidery. I use the finest hand-dyed high end embroidery floss for even more texture in my designs. My husband and I even hand dye our own weaver's cloth for our wall hangings and pendants. My sachet and Christmas ornament creations are especially unique as I stuff them with handmade mixes of herbs, spices and oils. Fall themed sachets are typically stuffed with mulling spices that were used for the season's apple cider and are especially delicious. Winter themed sachets are filled Maine Balsam fir and Eucalyptus or with a mix of lavender, vervain, tea roses and balsam fir for a refreshing woodsy goodness. Spring and summer scents can be lemon grass, citrus, lavender - anything light and refreshing. I have both ready to ship and made-to-order pieces available. Check the individual listing for specifics. Ready to ship items will clearly say: "This item is ready to ship" -Or the listing will indicate that the product is made to order. Purchasing a made-to-order design means it will be made for you in about 1 week (average, check individual listings for specifics) and shipped off! If you want a different color ribbon, background, fabric color, scent choice, anything, really - give me a shout! I can custom make pretty much anything and love to collaborate. I am dedicated to customer satisfaction - my #1 goal here is to make an heirloom piece you'll really love and will treasure forever! You can buy with confidence because if you don't like your piece you can absolutely exchange it or return it within 30 days. I accept payments via PayPal and Etsy Direct Checkout. Even if you don't have an account, you can use PayPal to pay with a credit or debit card. Per Etsy's policies, payment is required at time of purchase for the sale to be considered final. New York state residents will also be charged sales tax of 8.875% on their orders. I know it's a drag, but I have to do it, it's the law! All items shipping to destinations inside the US ship via USPS Priority Mail from NYC. Priority Mail is typically a 3 to 5 day transit time, depending upon where you live in relation to NYC. All items marked "ready to ship" will go out within two to three business days, provided there's no announcement indicating I am back-logged or out of town in my shop announcement (text space right below my banner). Made to Order and Custom orders will be made in the time specified in the listing, and any delays during busy times will be noted in my shop announcement. I ship all international packages via USPS First Class International. If you are overcharged for shipping at the time of purchase, I will refund when we take the your order to the post office and know the exact cost for shipping. Please note that shipping costs are shipping and handling. Sometimes international shipping can take a very long time. Please know that unfortunately, we cannnot track items once they leave the US. International shipping time varies greatly. Please allow up to one month for arrival of package although packages often arrive within a week or two. I will absolutely either refund or replace (your choice) if an international item gets lost in transit after one month. Also, please be aware that your own country's customs service may impose a range of import fees, taxes, tariffs, duties at the time of delivery. These are not in my control and I have no way of knowing when or if they will be imposed or how much they might be. For information you should contact your local customs agency. I cannot mark the custom form as a "gift". That is against the law. Occasionally, when shipping items internationally, an item will get flagged by the receiving country's Customs Department. It's a total bummer when it happens, but I have no control over this and unfortunately cannot be not responsible for extra charges incurred due to such flagging. Price advertised in my shop does not include duty or VAT. If charges are incurred, you will be expected to pay this once the shipment arrives. For the US: Shipping is currently set as Priority Mail via the USPS with delivery confirmation for both our peace of minds. If you would like a trackable service such as Fed Ex or UPS, please contact me and we can arrange. to USA: at least 5 business days from date of shipping. to Canada: generally 10 business days from date of shipping however - orders to Canada have sometimes been taking between 3 and 6 weeks recently, please keep this in mind if you are a Canadian customer. *PLEASE NOTE:* Please be sure that your Paypal and Etsy shipping addresses match. If there is a conflict between the two addresses, I will ship to the address listed with paypal. people sometimes forget to update their address on file with Paypal and/or Etsy. However I cannot be held responsible for addresses that have not been updated or are otherwise incorrect, so please verify this information before completing your purchase. Thank you! The lavender, Maine Balsam Fir, and Eucalyptus last super long. The bright citrus notes in the lemongrass or grapefruit fade a little bit faster, leaving behind the grassy notes of the lemongrass or lemon verbana. In a few year’s time you can always "recharge" your sachet or ornament with a couple of drops of essential or fragrance oil on the back fabric of the sachet. Q. What does FAQ stand for? Q: What the heck is punch needle? A: Punch Needle or Needle Punch, is an ancient rug-hooking technique shrunken down onto a much smaller scale and uses a special twice-threaded hollow needle, embroidery floss and weaver's cloth. Each tiny loop is hand punched with love by me. Q: How long does that take? A: Since each tiny loop must be hand punched and the needle must be twice threaded - it can be very time consuming to make just the punch needle portion of a piece. They are then framed, turned into a pin or necklace, sewn together with decorative fabric to make an ornament or sachet, etc. It depends upon the size and type. Each listing will tell you about how long they take to make. A small ornament takes about 1.5 hours of hand punching - then it takes about 30 minutes to sew on the machine, stuff, and hand sew closed to finish the ornament. A: Absolutely! I love taking custom orders. Feel free to convo me! Q: Where do you buy your patterns? A: I don’t! I create them all in my head, sometimes with the help of royalty free clip art. Q. Hey… I can do that! Do you sell kits and/or patterns? Q: Um... Punch needle "emergency?" Q: How long does the scent last on your sachets? A: The very first lavender sachet I ever made over five years ago is still holding its scent quite nicely. The lavender, Maine Balsam Fir, and Eucalyptus last super long. The bright citrus notes in the lemongrass or grapefruit fade a little bit faster, leaving behind the grassy notes of the lemongrass or lemon verbana. I note in the listing if a sachet/ornament is less strong smelling than others. Some are just a hint of a fragrance, rather than a headache inducing scream of scent. In a few year’s time you can always "recharge" your sachet or ornament with a couple of drops of essential or fragrance oil on the back fabric of the sachet. (Though I wouldn't recommend that for the ornaments/sachets that are backed with silk) Because most of my ornaments and sachets are small, none of them pack an overpowering scent punch. Just a hint of awesomeness. Q: What is with your obsession with avocados? A: I love them!! First of all, they are delicious. Healthy fats, Folic acid, Fiber, Potassium, Vitamin E. Yum! The ancient Aztecs believed avocados were an aphrodisiac. The Aztecs called them Ahacatl which means “green testicle”. (I swear! The interwebz told me so, they wouldn't lie!) They also symbolize lust, sexuality, fertility, potential, and continuity of life, richness and indulgence. But I also love them because they compliment the punchneedle technique so much, with the adjustable needle making such a realistic pit. Mostly, they are just plain quirky and fun! Q. Where do you buy your dyed weaver's cloth? A: My awesome husband and I dye the cloth ourselves. Q: Can I purchase some dyed weaver's cloth from you? Q: I love your work - but even thinking about scents gives me a migraine. Can you make me an ornament that is unscented? A: Absolutely! Any one of my pieces can be made with just regular polyfill instead of their herbs or spices. Feel free to convo me! Q. Isn't punch needle "cheating" at embroidery? A. I certainly don't think so! You may be thinking of the battery operated machines that let you cheat *at* punchneedle, but all my works are done in the old fashioned technique with a special needle that is tediously threaded twice with embroidery floss, and each loop is punched through the special fabric called weaver's cloth over and over. Q: How long will it take for my piece to arrive? A: That depends on a few factors - where you live in the world in relation to where we ship from (NYC), whether your piece is a ready-to-ship or made-to-order, and whether or not there's anything in my announcement (text right under the banner of my shop) indicating that I'm back-logged or out of town. Each listing, if it is made-to-order will tell you how long (approximately) the piece will take. If it's ready-to-ship, it will go out within two to three business days, provided there's no announcement indicating I am back-logged or out of town in my shop announcement (text space right below banner) See more about shipping under "shipping policy". Q: You're an actor and singer? Have I ever seen you in anything? A: Actually, YES! You probably have. You just didn't notice me, because I was fuzzy and in the background. Though my first love is Musical Theatre and I do a lot of it, my bread and butter these days is background work (Extra!) on shows like Boardwalk Empire, The Good Wife, The Following, The Leftovers, Blue Bloods, Person of Interest, Mozart in the Jungle, The Michael J. Fox Show, The Knick, various commercials and movies as well. Feel free to check out my band Sonas (Gaelic for Happiness) www.facebook.com/sonasfiddlers and you can also purchase our three albums here on Etsy! Q: Do you do consignment/wholesale? A: Due to the time consuming nature of my pieces it isn't very easy for me to make wholesale or consignment work, I take each on a case by case basis. Please feel free to convo me if you are interested!